I routinely walk by interesting buildings in Naples and realize that I don't really know anything about them. This is easy to do in a city that has 2500 hundred years of architecture in it. 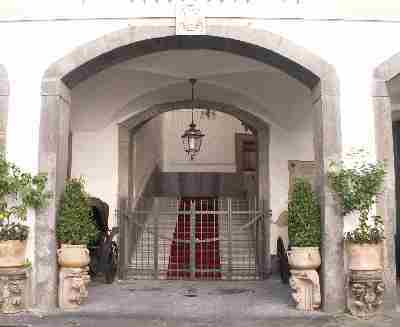 The original Archbishop's Palace was built in 1389 at the behest of cardinal Errico Capece Minutolo on the site of an old early Christian basilica. The building that one sees today, however, is largely the result of reconstruction and expansion of the premises under cardinal Ascanio Filomarino (1583-1666), completed in 1654. The work included clearing the area directly in front of the building to create a small open square between the Archbishops Palace and the church of Donna Regina Nuova. The building is unusually long and is marked by three stone portals. Ascanio Filomarino (image, below, right) was born in Naples of the noble family of the dukes Della Torre, and the surname appears prominently through other members of his family in Naples. He was the eldest of the five sons of Claudio Filomarino and Porzia di Leonessa. 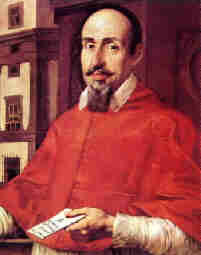 He obtained a doctorate of law in Benevento, became an ordained Cardinal priest in 1641 and was consecrated as Archbishop of Naples in 1642. He is of particular interest in the history of Naples since he was cardinal during two especially turbulent periods: Masaniello's revolt in 1645 and the severe plague epidemic of 1656. Filomarino's role in the revolt of 1645 was one of mediation between the rebels and the government. He was outspoken in his opposition to increasing taxation in the Spanish vicerealm of Naples, monies that the Spanish needed to pay for their part in the Thirty Years War. He was a focal point for the people against the overbearing Spanish throne and was trusted by the rebel Masaniello as well as by Genoino, the apparent real political strategist behind the revolt. As cardinal, however, he was part of the establishment and could approach the government; thus, he was in an ideal position to mediate. Filomarino certainly was aware of popular discontent in Naples and warned the Pope that the masses were "boiling". Some sources claim that Filomarino was primarily interested in reducing the power of the large landed Spanish noble class in favor of the growing, but overtaxed, merchant middle class in Naples. Further—so the claim—when Filomarino had used Masaniello to that end, he (Filomarino) arranged to have the rebel delivered into the hands of captors, where he was murdered. Such a claim is impossible to substantiate. There are a number of anecdotes about Filomarino. One is that during the plague of 1656, he ordered the churches to care for the stricken, yet apparently was among the first to seek refuge in the monastery of San Martino. Another was that he had to be reminded by Rome that the sacred relics of San Gennaro, patron saint of the city, were not his own personal property and that he was not authorized to claim, as he had, that "the relics are mine", nor authorized to remove them from the premises of the Cathedral of Naples for the purpose of soliciting miraculous cures in private homes. Also, Filomarino is said to have excommunicated a nobleman for not inviting him to his wedding. Cardinal Filomarino died on November 3, 1666, and is buried in the Naples Cathedral.